Our chart of the best baritone ukuleles saw some changes at the top to kick-off the new year. The distinctive Oscar Schmidt OU55CE came in to replace the Cordoba 24B, while the Kala KA-ASAC-B was replaced by the elegant solid spruce-topped Kala KA-SBG. We come to the biggest of the ukulele sizes – the baritone. It’s certainly not for everyone in terms of sound, tunings or playability, but for those who like a ukulele with a little more oomph, a baritone may well be what you are looking for. What Makes a Baritone Ukulele? What Does a Baritone Ukulele Sound Like? Compared to the smaller sized ukuleles, the baritone is the newest uke size – created in the 1940s, although the exact origins are unknown. It’s said that two men in particular – television star Arthur Godfrey and luthier Hercules ‘Herk’ Favilla – played a major part in the baritone’s development, although no exact details can be verified. However, if you’re interested, here’s an interesting article surrounding the birth of the baritone ukulele. When buying a baritone ukulele, there are lots of models crying for your attention. So, to help make your decision a little easier, we’ve compiled a short chart highlighting five of the top baritone ukuleles currently on the market. There are many more, but this chart gives you a good look at some of the most popular, most playable, and best value – ranging from just below $100 to those just pushing $500. Let’s dive into the chart, then stick around for our guide to baritone ukuleles. A performance-worthy baritone uke from Oscar Schmidt. 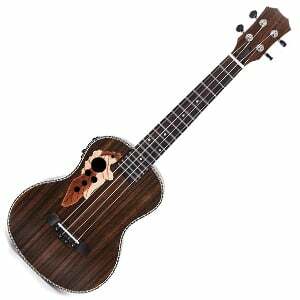 A delightful baritone uke with super sweet style and sound. A simple baritone uke in style, showing off good quality and value. This affordable baritone from Alvarez more than proves its worth! Impressive looks for such a budget baritone ukulele. The respected Washburn subsidiary Oscar Schmidt always cause some excitement with their ukuleles, as much as they do with their great-value electric and acoustic guitars – in particular, this beautiful baritone, the OU55CE. In fact, it almost feels like a miniature acoustic guitar, with a distinctive shape and an attractive laminated Hawaiian koa body. The deep cutaway increases the access to the wide nyatoh neck and 19 frets. Great looks and playability aside, the OU55CE is loaded with Belcat’s UK-2000 preamp, offering an excellent amplified tone – as we highlight in the full breakdown of the Oscar Schmidt OU55CE. It feels well put together, and – depending on the marketplace – comes with a good bundle of kit for the price you pay. It’s rare you find a ukulele chart without a Kala-branded instrument on it, and this list of baritones is no exception – in fact, we have two! Starting with this beautiful solid spruce-topped KA-SBG, which shows off a timeless design and expert craftsmanship for a baritone ukulele that’s actually very fairly priced. The elegant design is enhanced with the use of laminated mahogany on the back and sides, for a classic wood pairing and traditional, well-balanced tone – we’ve discussed this more in the complete Kala KA-SBG review. Although there are no electronics, the hardware on offer is also solid for the price, including closed-gear tuners, and a quality NuBone nut and saddle. Another Kala on our chart, this time part of the brand’s flagship Satin Mahogany series, which falls into the affordable sub-$200 price range. With a traditional body, the looks aren’t particularly striking, but there’s plenty of playability and quality on offer. The body – top, back and sides – are made from satin-finished laminated mahogany. Joining the body at the 14th fret, there also a mahogany neck, a rosewood fretboard (although this may be walnut, depending on the marketplace) and a total of 18 frets. The hardware is good for the price, and it sounds lovely too – leaning to the warm side of things. Everything you need to know about the Kala KA-B can be found in the full review. Take a rich sound, good playability and super value, and what do you get? The RU22B baritone ukulele from Alvarez Guitar’s Regent Series. For under 100 bucks you’re getting plenty of ukulele. There’s a full-size baritone body, which is humble in appearance, using laminated mahogany for the top, back and sides, with a simple abalone rosette to add a little character. The craftsmanship is commendable, with very little work needed out of the box to enjoy playing straight away. As we mention in the full review of the RU22B, this uke features a mahogany neck, 18 frets, and good hardware for the price – including a real bone nut and saddle, and very solid chrome closed-gear tuners. Looking for a budget baritone? It’s hard to look past the super-affordable Caramel CB500, which comes in at well under $100. There’s lots going on with the design, which gives it a very unique look, including a multi-soundhole and wooden leaf rosette which sits on a laminated rosewood body.On the neck sits a rosewood fretboard and 18 frets (joined at the 14th), while inside is a truss-rod. We look at the Caramel CB500 in more detail in the full review , but know that – even in this budget price range – this uke offers a basic pickup and preamp system, featuring 3-band EQ controls, allowing you to amplify the naturally warm tone. Great value. A baritone ukulele is the biggest of all the ukulele sizes, with a typical total length of around 29” (that’s a scale length of around 19”). With its extended length, a baritone uke will have around 18 to 21 frets, which is close to what a guitar would have. But the guitar similarities don’t end there. Instead of the G-C-E-A you may be familiar with on soprano, concert, and tenor ukuleles, a baritone features a different tuning. In fact, the four strings are tuned exactly like the highest four strings of a guitar: D-G-B E.
A baritone uke has quite a distinctive sound. It doesn’t quite sound like a ukulele… but then, neither does it sound like a guitar. While the materials used in the ukulele’s construction will play a part in the overall tone of the instrument (for example, maple bodies will be brighter while the use of mahogany is always much warmer), all baritones share some qualities. Because of the bigger body and soundhole, all baritones are acoustically louder than their smaller-sized counterparts, while offering a deeper, richer tone with more warmth than soprano and concert sized ukes – partly down to the size, partly because of the lower tuning. Baritones have their cons, but there is a lot going for this wonderful ukulele size. We’ve already highlighted the deeper, richer sound, which some ukulelists – jazz players in particular – prefer. A baritone is also easy to play – depending on the player as an individual. For example, if you are a guitarist, you’ll be able to play the baritone ukulele with no further instruction as it’s essentially the same experience, albeit without the lowest two strings of the guitar. This means notes and chords are the same. The string spacing and fretboard room is more generous too, so bigger-handed players will find a baritone easy to maneuver around. However, beginners to the ukulele should steer clear of baritones for the simple reason that learning from traditional ukulele chord sheets and song books – even online videos – will be difficult due to different tunings. Another slight negative is that there is generally less choice when it comes to baritone models. That’s not to say they can’t be found. However, when compared to the smaller sizes, you’re limited on choice – especially in the budget categories, where baritone models are few and far between. Having said that, as our chart proves, you can find a good budget baritone if you know where to look! As we’ve established, a baritone ukulele is a wonderful instrument – but it’s not for everyone. If you crave a slightly brighter tone, a concert or tenor ukulele would suit you better. Want the vibrant, happy, traditional Hawaiian ukulele sound? A soprano ukulele would be the size for you. For complete beginners, we always recommend a concert ukulele, as these are a great all-rounder – offering the typical ukulele sound, standard ukulele tuning, and a decent sized fretboard to get to grips with. There we have it – baritone ukuleles discussed and digested! If you’re ready to try one out, you’ll need to get your hands on one. Watching videos online, reading reviews, and – where possible – trying out a range of ukuleles is the best way to know which model is right for you. Although if you start with the five on our chart, you’ll see what the benchmark of a good baritone ukulele is. Good luck with your search for your ideal baritone ukulele! I am 63. I have started learning the guitar since 2 yrs. I find the learning curve a bit too steep for my age. I want to learn some instrument in that line. So I thought of swithcing over to an ukulele. I found the baritone one is probably right for me as learning that is same as the guitar with 2 less strings. What is your suggestion?